Celebrate with a cigar worth celebrating with! These Nicaraguan-made lovelies combine a mellow mixture of Cuban-seed Nicaraguan and Dominican long-leaf tobaccos inside a lovely Connecticut wrapper from Ecuador. Each leaf was extensively aged prior to rolling, giving you a crowd pleasing cigar to be enjoyed by all. The flavor is rich and creamy with a complex bouquet and soft, elegant aroma. As for the price? Forget about it….don’t waste your time finding that perfect box of expensive puros most people won’t enjoy anyway. These cigars are top-notch, offering superior quality and enjoyable flavors every time. 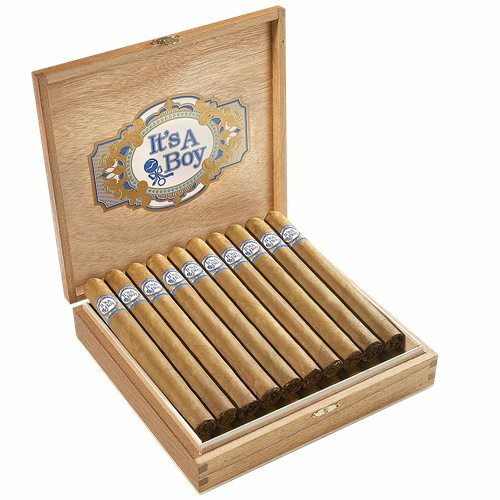 It’s a Boy Cigar is the perfect gift for that special notice!